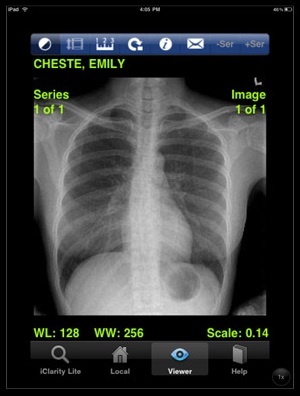 Would the iPad be a good tool for radiologists? In a recent article in Advance for Imaging and Radiation Oncology, radiologist Sam Friedman takes a closer look. The iPad exceeds the values for medical displays category A, which is suitable for all medical imaging (except mammography). Is the iPad screen adequate for diagnostic reads--at least for digital, cross-sectional imaging? Yes, according to Stephan Popp, CEO of aycan Digital. So, it looks like the display hardware is in place. Take a look at these sample images from an iPad using the current iPhone apps in a magnified form. At present, there are no dedicated iPad viewing apps, but the iPhone apps can be used in a magnified format on the iPad. What about the processing power needed to effectively power the display? The ultimate solution probably will involve server-side processing and rendering. Even if the iPad itself is computationally overwhelmed by high-level visualization, it could serve as a portal into a big server that can handle such things. (Certainly this can be done in a more optimal manner than with the rather clunky Citrix interface!) A thin computer deserves a very thin client, or even a zero-client solution, and that may be the architecture in the iPad's future. (Of course, no Flash programs are allowed in this scenario, thanks to Apple.) Picture the rendering above with Multi-Touch controls that allow on-screen manipulation of the image in real time with finger gestures. All we need is the right software and the right connection. How long will we have wait for this technological panacea? As usual, if I've come up with a wonderful idea, someone else has had it first. With its ResolutionMD Mobile app, Calgary Scientific Inc. has just about perfected the approach I thought was years away. This app has already received approval by Health Canada for diagnostic use by Canadian physicians; it has also received FDA approval and been given the CE Mark for the European market. 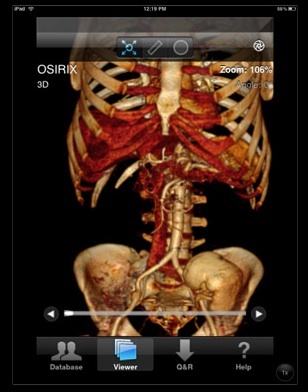 So far, ResMD is only dedicated for the iPhone, but an iPad version is coming shortly. 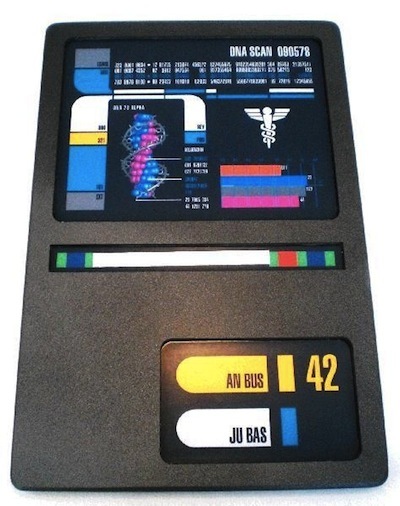 Science fiction fans have long been shown representations of medical tablet computers, both in the original Star Trek series and in shows like Deep Space Nine. Read the detailed article at AdvanceWeb.